Bo Atabey [a Taino Indian word meaning Great Mother Earth] St John vacation rental villa located on Seagrape Hill overlooking Coral Bay and Bordeaux Mountain, easily accessible by paved roads-just minutes from restaurants, shopping and night life...The North Shore (gin clear) water and white sandy beaches are a short 10 minute drive. 2 equal King Master Suites w/native stone outdoor showers, Private Pool, Quiet location. DISCOUNTS: 5% for 10 nights or longer & 5% for booking 6 months in advance - discounts can be combined. Enjoy panoramic views of Bordeaux Mountain and valley, Coral Bay Harbor, Johnny Horn Trail, and the Moravian Church from every room, veranda and pool deck. Custom-made Mahogany Counters with Onyx Vessel Sinks and Waterfall Faucets, Native stone outdoor showers. Mountain Range view from All Rooms, Deck, Lanai & Pool Area. View of Coral Bay Harbour from All Rooms, Deck, Lanai & Pool Area. Thanks Bob and Linda for sharing your wonderful island home with our family of 5! My husband & I celebrated our 1st wedding anniversary on St. John 16 years ago & were looking for a perfect villa to bring our 3 girls this year (ages 14, 12 & 9). Bo Atabey was perfect the perfect place! 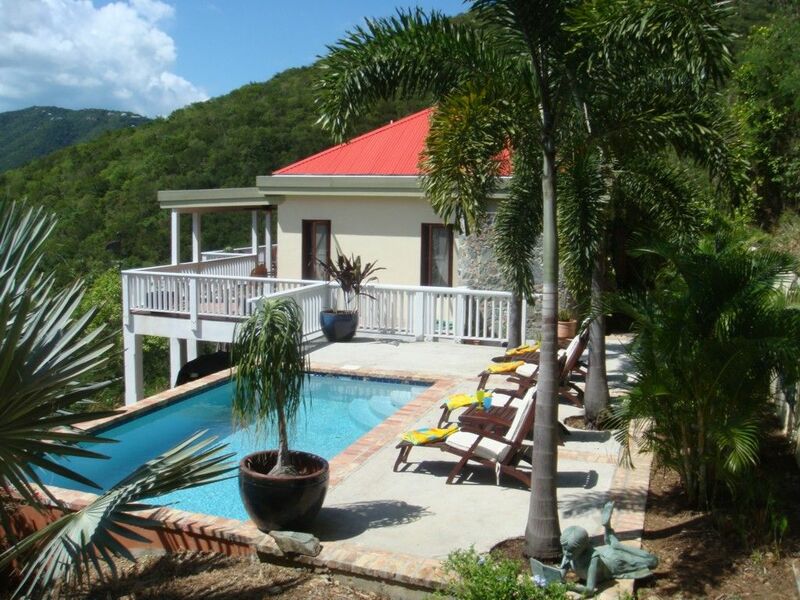 The villa is very well appointed & very clean & great views of Coral Bay. We loved being in Coral Bay & the villa is very close to fun restaurants & stores. Our favorites are "Skinny Legs" & "Shipwreck Landing." We also enjoyed Miss Lucy's & Chateau Bordeaux & Caneel Bay Resort for lunch! All the beaches are wonderful & great snorkeling! Be sure to rent a jeep to get around. My girls loved the pool & my husband & I loved the outdoor decks & views! I would highly recommend this villa & island for families who want to relax & have a little adventure! Thanks again for making our winter break so special. We needed it & a great break from all the New England snow this year! We'll be returning to this wonderful island again! We enjoyed the house tremendously, beauty and comfort, we couldn’t be happier with our stay. The drive up was scary at first, but we got used to it, I mastered the switchbacks without having to back-up, I felt like a local. As an architect, and my husband a finish carpenter, we marveled at the craftsmanship of the roof framing, the routed edge detail on the bottom of the roof rafters, things that most people might not notice, or understand the extra work that went into getting it to look like that. All of the sculptures around the house and the landscaping were great. I see all the thought and decisions that went into everything, most people don’t realize how many decisions you have to make to build a house until they are in that position, it can be overwhelming. Congratulations on creating a wonderful place that didn’t just give us a place to prepare meals and sleep, it’s beauty added so much to the enjoyment of our stay, we will never forget it, hopefully some day we will return. We recently stayed here with our two young girls and it ended up being a perfect choice! The location worked really well for us -- close enough to Cruz Bay to drive there when we needed something (groceries, gas), convient to both the northern and southern beaches, and private enough to be away from it all. The pool was especially great and perfect in the mornings for the kids to have an early swim, while the parents relax. We hope to return again! Our family of four thoroughly enjoyed our stay! The house was clean and well maintained. We enjoyed the pool after coming back from the beaches. We especially loved the outdoor showers! That was a neat island experience. We made good use of the kitchen and enjoyed watching movies in the evening. The only reason that we aren't giving it a 5 Star rating is because the house does not have air conditioning. That said, we had a great time and enjoyed everything about our stay at Bo Atabey. The villa was amazing and met all our expectations ... it was very hard to leave. From the deck overlooking Coral Bay (our favorite spot to hang out), to the pool, to the outside showers, to the kitchen ... everything was perfect. The gentle island breezes flowing through the house were a welcome relief from the over-used air conditioning on the East Coast. It was our first trip to St. John and we were smitten. We hope to come back soon. One week was not enough. In april 2012 my husband and I spent a week at Bo atabey with our sons - ages 8 and 10. This was the second time staying in St John for my husband and I. First for our kids. We chose Bo atabey for the location and amenities. And we were not disappointed. The home is located on the "quiet side" of the island, away from the tourists but with easy access to the best beaches and restaurants on the island. The drive up to the house is a little tricky, but most rentals with views have the same issue - so it's a bit of a wash. Once you get up to the house, you'll see why the drive was worth it. The house is open concept with spacious rooms and a brilliant layout that allows you to take in the outside from every room. I especially loved the layout of the kitchen and great room. So much so that I found myself wanting to prep meals at home vs going out every night. Especially bc my kids were able to play in the pool while I prepped. Actually, they played in the pool every chance they could. The outdoor showers were a special and welcome treat. The porches made coffee in the morning extra special. As far as the area - we love it. There are several great places to eat in the area - Skinny Legs and the Donkey Diner being our favorite. We also enjoyed being closer to the less touristy beaches. Maho Bay was our favorite. All in all, we would highly recommend Bo attabey for families that truly want to get away and enjoy their private time together. Thanks go out to Bob and Linda for sharing this lovely slice of paradise with families like ours. are small shops, all types of restaurants many have live music, Sailboat and dingy rentals, Horse-back riding and hiking trails. The Coral Bay ball field is home to The Jazz Festival, Wagapalooza and the 8 Tuff Miles finish line.